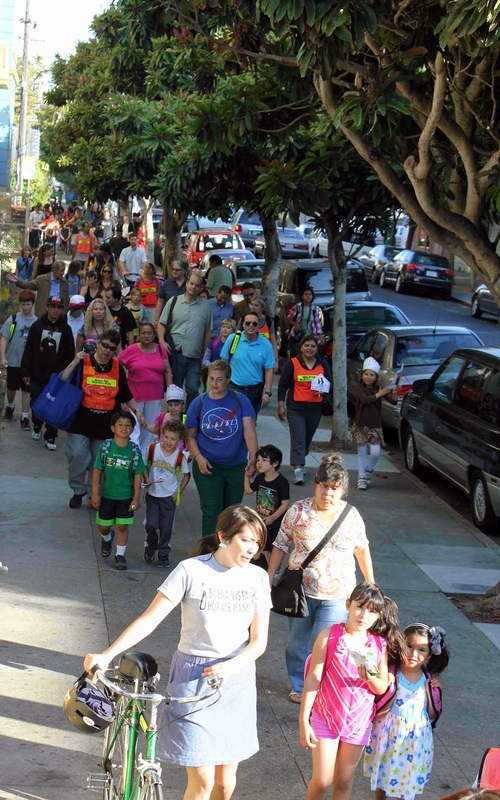 Schoolchildren, along with local elected officials, laced up their sneakers Wednesday morning and walked through the Mission district to celebrate Walk to School Day. A group of about 40 students, parents and teachers from Buena Vista Horace Mann K-8 walked from Parque Ninos Unidos at 3090 23rd St. to their school at 3351 23rd St.
One parent, Erika McDonald, who walked with her kindergartner Amy, said most days she walks the four blocks to the school from the family’s home on Shotwell Street. McDonald, a working mom, said the routine keeps her active in the mornings and afternoons, and pushes her to walk about a mile a day. 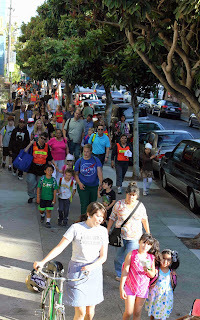 Buena Vista Horace Mann was one of 55 San Francisco public schools participating in walk-to-school events. District officials said nearly 8,500 students would be taking part in the events, which highlighted pedestrian safety and The City’s Safe Routes to School program. At Parque Ninos Unidos, Recreation and Park Department General Manager Phil Ginsburg led students in a series of exercises in the grass, along with Supervisor David Campos, Board of Education President Norman Yee and state Assemblyman Tom Ammiano. Ammiano walked with his daughter and three young grandchildren, some of whom attend Buena Vista Horace Mann. When the group arrived at the campus, a rally was held in the schoolyard. Campos made brief remarks in Spanish, urging students to stay active and keep walking. Principal Jennifer Steiner described the benefits of walking, including staying healthy and protecting the environment. “Every day I walk to school from 16th Street, and I feel great when I get to school,” she said. Steiner, switching to Spanish, announced plans to establish a weekly Wednesday walking group from Parque Ninos Unidos to Buena Vista Horace Mann, and encouraged students and parents to join in.